You have to admire the enthusiasm and dedication of Finn sailors. 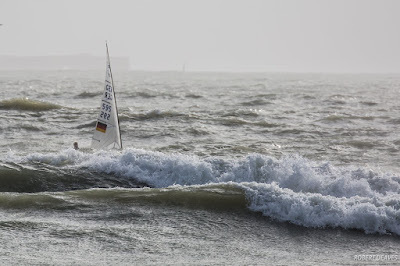 It is a long journey to Cádiz from almost anywhere, but coupled with the extreme bad weather across Europe over the past few weeks, it is nothing short of miraculous that nearly 100 boats and sailors have gathered in this far flung corner of Europe to contest the 2018 Open and U23 Finn European Championships. The Opening Ceremony was held at the Puerto Sherry Hotel with brief welcomes followed by a finger buffet and drinks. The sailors were welcomed by Enrique López Bosch, president and CEO of Puerto Sherry, and Francisco Coro, president of the Andalusian Sailing Federation. Snr Coro thanked the sponsors for the event which made the championship possible. Corinne McKenzie, Executive Director of the International Finn class replied and complemented the organisers on their efficiency and ease of putting together the championship at short notice since September. She also commented that it was good to see a large Spanish Finn fleet in Cádiz, especially a high number of U23 sailors. She then declared the championship open. Finally the current European Champion, Jonathan Lobert, presented Snr Coro with the European Trophy for safekeeping during the week. Joking about the weather, he said, “Today was a classic Cadiz weather, a lot of rain, a lot of wind and big waves. This is not what we were expecting. I felt like I was at home in La Rochelle, so I really enjoyed today." The fleet here is the most competitive Finn fleet for several years with only a few top sailors missing. They all sail in one fleet, but the U23 European Title will be as hotly contested as the senior title. There are an impressive 33 U23 sailors, making this one of the biggest U23 European Championships for many years. Measurement concludes Sunday morning before the practice race on Sunday afternoon, though many have already decided not to sail as the forecast is for very strong winds.